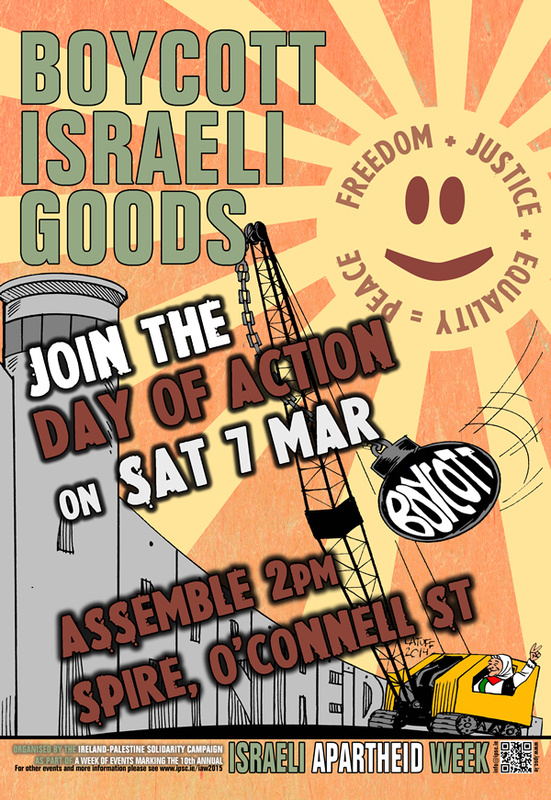 To kick off Israeli Apartheid Week 2015, we ask you to join the IPSC Dublin branch for a Boycott Israeli Goods day of action. 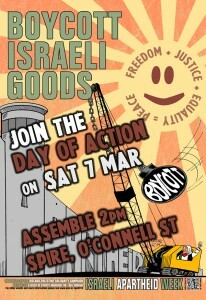 ON Saturday 7th March, Assemble at 2pm at the Spire, O’Connell Street. From there we will visit several city centre outlets that stock Israeli goods, making consumers aware of their presence, the connection between these products and the occupation of Palestine and asking people to boycott them. Israeli exports – from both the illegal settlements and inside Israel – contribute to the economy of Israel’s apartheid occupation regime and the oppression of the Palestinian people. Indeed, the Israeli government is dependent on a strong export-orientated economy and Europe is Israel’s largest trading partner.